Padstow Christmas Festival is a not-for-profit event run by volunteers. It is thanks to our fantastic sponsors and the goodwill of local businesses that we are able to make it all happen. In 2012, we partnered with some of the UK’s top chefs to create The Padstow Festival Cookbook as a collaborative fundraising venture to support our much-loved event. It was a great success selling over 5,000 copies. A completely new edition for 2014, The Cookbook features a collection of recipes and tips from culinary stars who have appeared at the festival over the years. The book is filled with delicious dishes that can be replicated at home during the festive season and throughout the year. 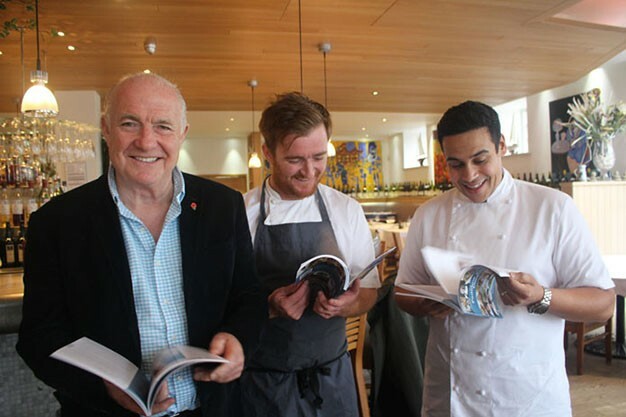 Two of the festival’s biggest supporters, Rick Stein and Paul Ainsworth, have written the foreword to this year’s book, which includes recipes from Nathan Outlaw, Mark Hix, Mitch Tonks, Tom Kerridge, Michael Caines, Angela Harnett and Ashley Palmer Watts plus many more. We are incredibly grateful for the support from all the chefs involved. It is available to buy for £9.95 from selected locations across Padstow and at the Festival. It is also available by post from Padstow Tourist Information Centre.